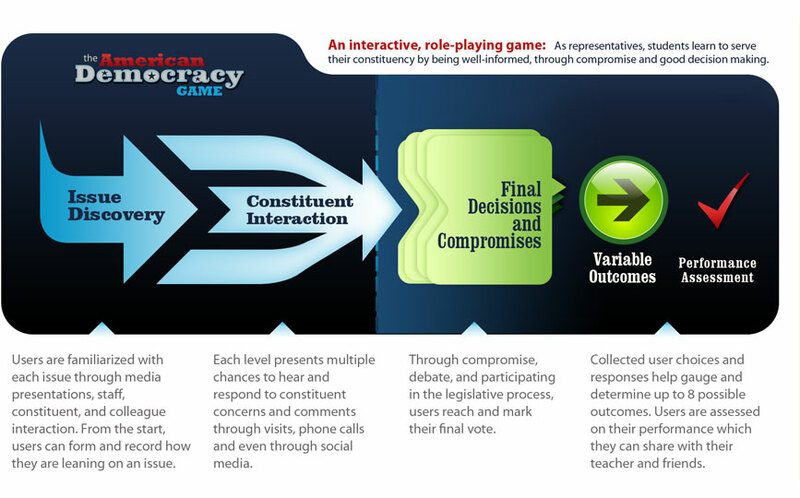 The American Democracy game was developed by the National Conference of State Legislatures to help young people, especially students in grades 6-8, better understand the workings of representative democracy. This downloadable interactive presentation is designed for legislators and teachers to use with students to discuss representative democracy and introduce the American Democracy Game. This presentation, and the game itself, teach students about the importance of government in their daily lives, the kinds of people who represent them in legislatures at all levels, and how our elected officials use debate, negotiation and compromise to resolve disagreements on public policy issues. The speaking guide and resources are additional materials that legislators can choose to use for outreach with educators and students. Gain an understanding and appreciation of how our republic or system of representative democracy works. Learn how the work of Congress and state legislatures affect people�s lives every day. 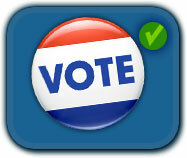 Understand that citizen participation is important and that they have voice in government. Learn that legislators care what people (students) think. Understand that debate, negotiation and compromise are essential to the lawmaking process and that without compromise, nothing would be accomplished. Develop awareness that special interest groups have a legitimate role in the legislative process and represent your interests. Understand that legislators are accountable. The American Democracy Game requires Adobe Flash Player version 10 or higher. You can update your Flash Player here. 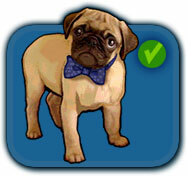 In level one of The American Democracy game, students receive an introduction into the world of representative democracy, including vocabulary such as: "constituent" and "representative". Through game play, learn key concepts, such as: the importance of gathering diverse input, the role of a representative�s staff, the importance of communication and professionalism, and the process of compromise. After being elected to office, the student faces the challenge of dealing with a community issue. The city council of the fictional city of Setterville, is considering a bill to build a local dog park. The student is presented with an overview of the bill and a summary of some potential concerns. The student then gathers as much information as possible to make an informed choice. Three compromise opportunities are presented, and depending on the student�s choices, the game unfolds into a multiple scenario experience, where they attend a city council meeting and vote. After the vote, the student finds out whether the bill passes or fails. The student then receives an assessment of their performance as a representative. How did you feel about receiving two petitions; one from Dougie Barker representing people only in favor of the dog park (otherwise known as the minority) and one from Tanya Teacher and Timmy Learner representing people in favor of a community park, which included a dog park, picnic grounds and playground (otherwise known as the majority)? Did you pick up on the fact that if you chose to support the community park/the majority you actually were supporting all groups (because the people in favor of only the dog park would also get what they wanted)? Did anyone play the game on the opposing side of any park? What was that like? If you play the game again, do you think you will try making different choices to see how the outcome can vary? Level two of the American Democracy game introduces the student to a more challenging issue at the state level of government. In this level a fictional bill has been introduced to increase the school day by one extra hour, so students can participate in mandatory afterschool physical activities. Similar to Level one, the student reviews an overview of the bill and a summary of some potential concerns. The student will then play through experiences, where they will gather information to make an informed choice. The game offers tree compromise opportunities, and depending on the student�s choices, the game unfolds into a multiple-scenario experience, where players attend a committee meeting and then a vote. After the vote, the student finds out whether the bill passes or fails. The student then receives an assessment of their performance as a representative. What are the pros and cons of the idea that our state could make a law that would require you to stay at school for an extra hour to do physical activities? 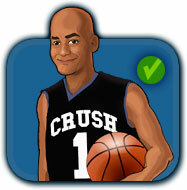 Did having a celebrity endorsement from Crush Dunkin make you want to support the bill any more or any less? Did any of the concerns brought to you by people in the game help to sway your leaning? Did anyone play the game on the opposing side of the bill? What was that like? If you play the game again, do you think you will try making different choices to see how the outcome can vary? Find out about a bill that has recently been introduced in your state legislature. Who supports it? Who opposes it? Can you come up with any possible compromises? Level 3 - Change the Voting Age? Level three offers a completely unique experience to the students. In the first two levels existing bills are being proposed and debated. Level three starts with the student hearing a debate about what age a person should be to vote. Then they will learn a little more about each side of the issue, before they are asked to take a stance. After the student receives all the information they need to make a choice, they are asked to choose a side (this is a decision that once it is made it can�t be reversed unless the student starts this level over). Support the raising of the voting age - If they student makes this choice they will be on a path to promote and gain support for the new bill to raise the voting age to 21. It is explained to the student that this pathway is also unconstitutional based on the 26th amendment. Support the lowering of the voting age - If the student makes this choice they will be on a path to promote and gain support for the new bill to lower the voting age to 17. Support keeping the voting age at 18 - If the student makes this choice they will be on a path to defeat and gain support against the new bill to lower the voting age to 17. How did you feel about the debate? Did you feel like each character did a good job of representing their group? Do you think group leaders, like these three characters (who are informally elected by their groups to represent the group) play a big part in representative democracy? If so, why? If not, why not? What did you consider when you had to make the hard decision about which side of the issue to support? Which choice did you make, and why? What did you think about your interview with Scoop Cooper? What did you learn from that experience? If you play the game again, do you think you will try making different choices to see how the outcome can vary? Did anyone choose to try and raise the voting age? What did you learn about the constitution? Research Amendment 26 to the U.S. Constitution. What were the arguments for and against this amendment? To tell us what you think of the game, please fill out our feedback survey. © National Conference of State Legislatures. All Rights Reserved.